With thousands of lawsuits involving testosterone products currently pending, eight of those cases have now been selected by a federal judge for early trials. Known as bellwether trials, these first lawsuits may provide insight into how juries will react to evidence and testimony in the more than 5,500 cases currently pending. In all of these lawsuits, plaintiffs are alleging use of testosterone products like Androgel have led to serious and even deadly side effects like heart attack and stroke. U.S. District Judge Matthew F. Kennelly is currently overseeing around 5,500 lawsuits involving testosterone replacement therapies in the Northern District of Illinois. Plaintiffs in those cases have been prescribed testosterone products originally approved by the FDA to treat specific medical conditions that lead to a drop in testosterone levels in men. However, the drugs have also been used off-label to treat a wide range of symptoms related to the aging process, such as energy loss, decreased muscle mass and reduced libido. The manufacturers of products like Androgel, Axiron and Testim have touted their products as anti-aging formulas for a large percentage of men that suffer the symptoms associated with lower testosterone levels. The drugs come in a variety of forms, including injections, gels, pellets and patches. While the products can indeed bring relief to men suffering from severely low testosterone levels, they can also increase the risk of heart attack, stroke, pulmonary embolism and death, particularly in men with a history of cardiovascular problems. In March 2015, the FDA issued a safety communication, cautioning men against taking testosterone products for low testosterone levels associated with aging. The agency also required companies manufacturing these drugs to change their labels to clarify the appropriate usages for their products. Manufacturers were also required to add warnings about the risks of heart attack and stroke associated with taking these drugs. Men who experienced serious side effects from testosterone therapies began filing lawsuits against the manufacturers of the drugs, alleging these companies did not provide adequate warning about the risks associated with their products. As the number of lawsuits grew, the litigation was coordinated into multidistrict litigation for the purpose of streamlining early trial proceedings and serving the convenience of the parties, witnesses and courts. Judge Kennelly was assigned to oversee the growing litigation. On August 3, Judge Kennelly issued an order identifying eight cases as bellwether trials. Four of these cases involve heart attack or stroke, while the other four involve a blood clot injury such as pulmonary embolism or deep vein thrombosis. 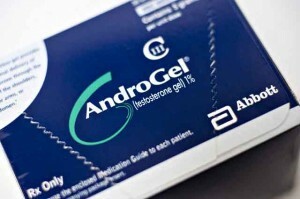 All of these cases involve Androgel, a testosterone drug manufactured by AbbVie. The first case, which is slated to begin July 2017, was filed by Jeffrey Konrad. Konrad claims he suffered a myocardial infarction after taking Androgel. The order of the remaining seven cases will be determined at a later date. Once these eight trials are completed, Judge Kennelly is expected to select a second group of bellwether trials that will include Axiron, Testim, Androderm and other testosterone products. While decisions in bellwether trials are not binding in other cases, they can provide valuable information as to how trials might proceed in the future. These early trials can also serve as a catalyst for settlement negotiations between plaintiffs and defendants. If a settlement is not reached, Judge Kennelly may begin remanding cases back to district court for individual trials.